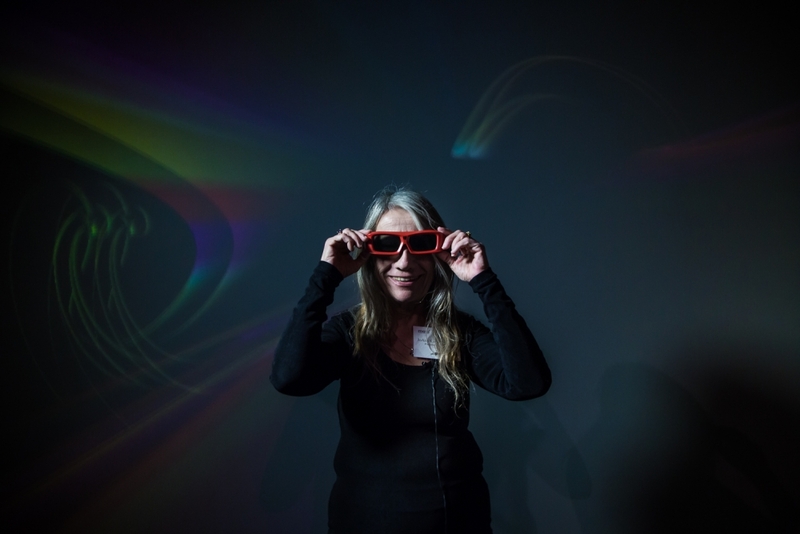 JoAnn Kuchera-Morin, founder/director of the AlloSphere at UCSB, and a professor of media arts and technology and of music, will give a talk and free public demo of the AlloSphere for the AWMAT conference. 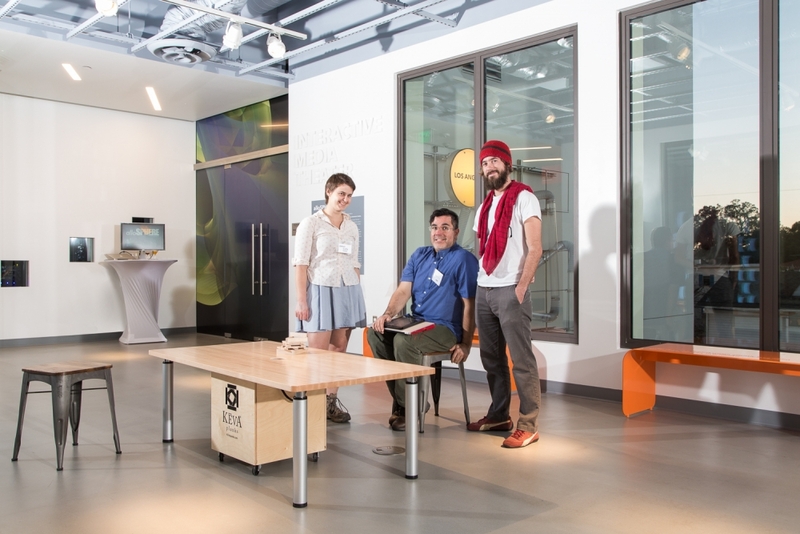 From left to right, UCSB doctoral students Hannah Wolfe, Gustavo Rincon and Tim Wood, all part of JoAnn Kuchera-Morin’s AlloSphere Research Group, outside the media theater at MOXI. The big reveal did not disappoint. A year in development and then some in the making, a unique collaborative project of UC Santa Barbara researchers and MOXI, The Wolf Museum of Exploration + Innovation is at last live at the new public facility now open for business. To call it a display isn’t a remotely fair descriptor of the captivating experience in science, technology, engineering, art and math — or STEAM — that is “Probably/Possibly.” The piece and the complex instrument on which it runs were conceived, designed and built for MOXI’s media room by UCSB’s JoAnn Kuchera-Morin, a professor of media arts and technology and of music, and her AlloSphere Research Group (ARG). Surrounded by a 100-degree curved screen and active stereo projectors, visitors use touch screen and mobile devices to engage with the installation, which uses various wave functions to explore the currents of an electron inside a hydrogen atom. An elegant interface exposes parameters of the simulation and of the visual and aural rendering, and allows users to compose their own media pieces through sequencing state presets. Boom. Those are precisely the things Kuchera-Morin and her team aspired to achieve with the innovative endeavor to not only give the community direct access to university-level arts and science, but also to involve them in its creation. “It’s been a wonderful collaboration and very successful on all counts,” Kuchera-Morin said of the ARG-MOXI partnership that has culminated with the museum’s opening. “Being able to align with the very informed and educated public out there in Santa Barbara and show them a new vision and future directions, and the excitement we got at that level, the aspect of partnering with the community, to let them engage with what we’re doing out here at UCSB and get their input, from their perspective — it’s all been really exciting. The two institutions were spurred to join forces on the media installation by a common mission of public service and a mutual aim to foster public engagement with STEAM subjects. Kuchera-Morin’s group and MOXI also share a goal of reforming education at the intersection of arts and science. Their successful collaboration is a model for what such a partnership can be, according to Hinkley. Indeed it has, concurred Kuchera-Morin, who characterized the effort as a proof of concept. On its vision to grow the local STEAM community and test a cooperative model that could be replicated by other programs at UCSB and other organizations on the Central Coast, the pilot outing, she asserted, has delivered.